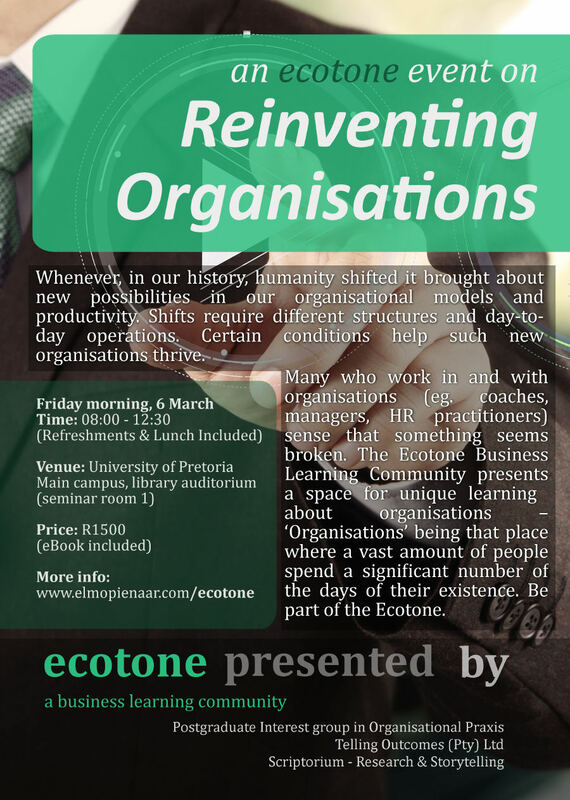 You are invited to attend our Reinventing Organizations event (below) and become part of the ‘Ecotone – Business Learning Community.’ There are at any one or all four half day learning intensives on various organisational subject matter. It includes areas such as leadership and management perspectives, themes like the Project Management Office (PMO), to Coaching, to Workplace Spirituality, Values, Stories, unique perspectives on Stragegy and more. Borrowing the name from another discipline – the name, ecotone, suggests these events constitute a unique business learning community between various disciplines. Ecotone events are presented in conjunction with the Postgraduate Interest group in Organisational Praxis consisting of Masters and Doctorate students from various universities and institutions, consulting firm Telling Outcomes (Pty) Ltd, and Scriptorium – Research and Story Telling Centre. While the costs for each learning event may vary and some cases places/seats are by invitation only you can secure your presence at all four 2015 events through preregistration (see dates below). Please inquiry via the contact form. If you wish to join for all four events in the year, I can offer you a discount. Do contact me. All events include facilitated learning, book discount or relevant articles, presentations, latest from the community of researchers in organisational praxis, networking. Whenever, in our history humanity shifted it brought about new possibilities in our organisational models and productivity. Shifts require different structures and day-to-day operations. Certain conditions help such new organisations thrive. Many who work in and with organisations (eg. coaches, managers, HR practitioners) sense that something seems broken. 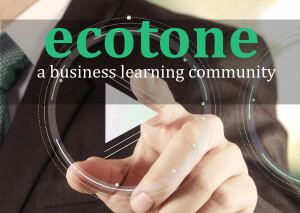 The Ecotone Business Learning Community presents a space in which to learn about organizations – ‘Organisations’ being that place where a vast amount of people spend a significant number of the days of their lives. Consider with us, on 6 March (08:00 – 12:30) what it takes to Reinvent Organisations. CONTENT: Conversations and presentations related to the book Reinventing Organizations written by Frederic Laloux (free download), input from some of the postgraduate research projects, and facilitated learning in group. While the book is important to the event, the event is not about the book in isolation. More information on the book can be accessed from the registration page. As founding consultants of‘Telling Outcomes’ (Pty) Ltd, Elmo and Francois emphasize various forms of coaching, corporate counselling, professional facilitation as effective means of leading and managing organisations and people. Herein, narrative ideas have an important role in all matters from Strategy formulation and implementation, organisational culture, team work to individual performance. For the past number of years, as a research fellow at the University of Pretoria, Elmo took focus on the theme of Narrative and Spiritual Coaching in Organisational Development, comparing coaching to other practices such as consulting and facilitation. Prior to this he has been involved in profit and non-profit driven organisations and founded or developed several business. 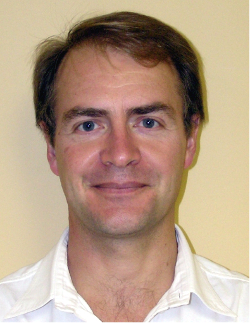 Initially trained as a statistician, Francois spent some time in academia lecturing in Mathematical Statistics. 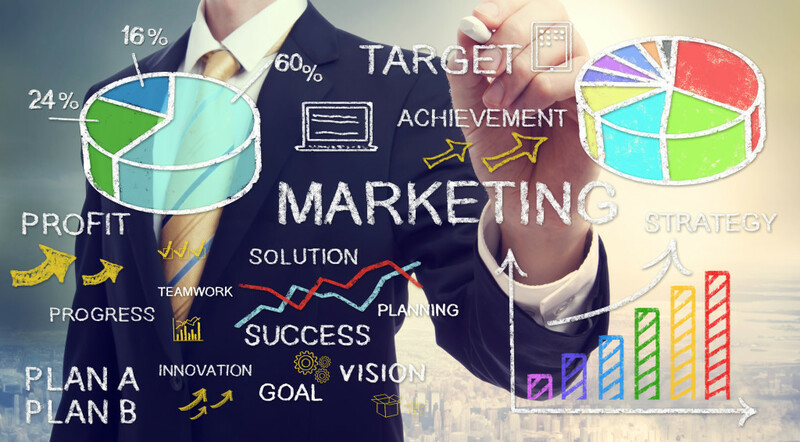 He subsequently worked as Business Development Manager for a multinational pharmaceutical company. He has done change strategy planning, knowledge-based strategy development, market research, impact analyses and pharmacoeconomics studies. 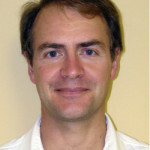 He has written the only South African text on pharmacoeconomics (Pharmacoeconomics – The Value Argument in Medicine). 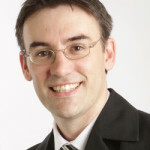 He is currently involved in Social Economics (including pharmacoeconomics) and Coaching (including life coaching, team building, and cultivating communities of practice). His MTh research investigated resilience within stories of transformation and transition. It was followed by a PhD titled ‘Narrative Reflections on a Life that Matters’ exploring how a narrative approach expand stories of significance.